Birda came to KyEHC extremely emaciated and in poor body condition. She is gaining weight rapidly. As soon as she is at her ideal weight we will begin to assess her riding potential. Birda gets along great with other mares and is easy to work around. We have no history on this sweet girl. 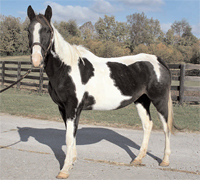 For more information on Birda or any of the other horses at the Kentucky Equine Humane Center, visit /redirect.php?location=http%3a%2f%2fwww.kyehc.org%2f.